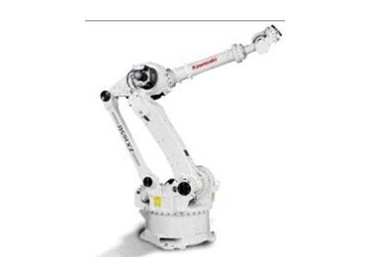 A Kawasaki robot, available from CIES. CIES is the Australian distributor for a range of Kawasaki robots. Kawasaki has been manufacturing robots since 1969, building a reputation for high performance and reliability. Kawasaki robots have been installed at over 1000 locations across Australia; 150 units were sold in 2004. Mitsubishi Motors recently installed Kawasaki robots for their new Magna production line. With four main series and a multitude of models, CIES can offer robots that can handle items weighing a few grams to a huge wide spectrum of tasks. * F Series - This small to medium size, 6 axis range can handle payloads from 6kg to 60kg with models ideal for assembly, handling, scaling, cleanroom, arc welding and wash down applications. It is characterized by high speed, compactness and ability to be extended and expanded. * Z Series - A multi-purpose, 6 axis robot in floor and shelf versions. Eight models offer payloads from 130kg to 300kg. Wide work envelope and small foot print makes the Z series ideal for heavy workload in confined spaces. * M Series - Super heavy duty, 6 axis range with payloads up to a huge 500kg. It is suitable for handling engines, car bodies, construction materials or large appliances. With a 2.5m extendable reach, high wrist torque o 3,920 Nom, the M Series is a flexible workhorse. * K Series - A range of eight models, a choice of 4 wrists, the K series ca be combined with various painting package cells to handle the widest range of spray painting applications. These include servo twister, tombow, shuttle, spinner and turntable. The model includes an explosion proof design, which adds safety and peace of mind. * D and C Series Controllers - Advanced range with expansion capability, these can be operated with keyboard or large LCD touch screen pendant.